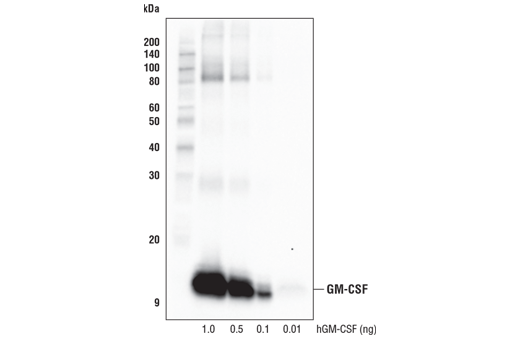 Western blot analysis of recombinant Human Granulocyte Macrophage Colony Stimulating Factor (hGM-CSF) #8922 using GM-CSF (E8I1V) Rabbit mAb. Western blot analysis of extracts from NK-92 cells, untreated (-) or treated (+) with TPA #4174 (80 nM, 5 hr), Ionomycin #9995 (3 μM, 5 hr), and Brefeldin A #9972 (300 ng/mL, last 4 hr of stimulation), using GM-CSF (E8I1V) Rabbit mAb (upper) or β-Actin (D6A8) Rabbit mAb #8457 (lower). 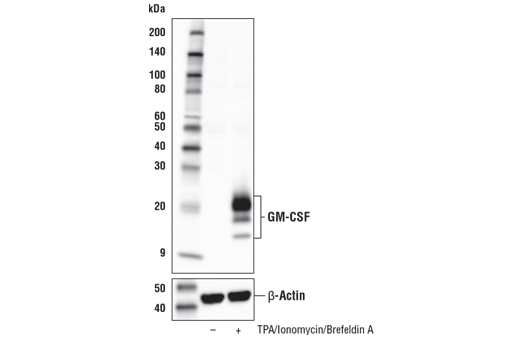 GM-CSF (E8I1V) Rabbit mAb recognizes endogenous levels of total GM-CSF protein. Monoclonal antibody is produced by immunizing animals with a synthetic peptide corresponding to residues surrounding Pro29 of human GM-CSF protein. GM-CSF is produced by activated T cells, NK cells and macrophages (1,5). Target cells include granulocyte, monocyte precursors and subsets of differentiated myeloid cells (1,2,3). Many target cells require GM-CSF for survival. GM-CSF induces proliferation, is involved in hematopoietic differentiation of dendritic cells, and is a key factor in differentiation pathways leading from stem cells. GM-CSF activates effector functions of myeloid cells, thereby linking adaptive and innate immunity and in turn may boost anti-tumor immunity (4). GM-CSF receptor is composed of GM-CSFRα and the common β chain, βC, which is also utilized by IL-3 and IL-5 (1). Binding of GM-CSF initiates the Jak2, Stat5, and PI3K/Akt pathways (1).